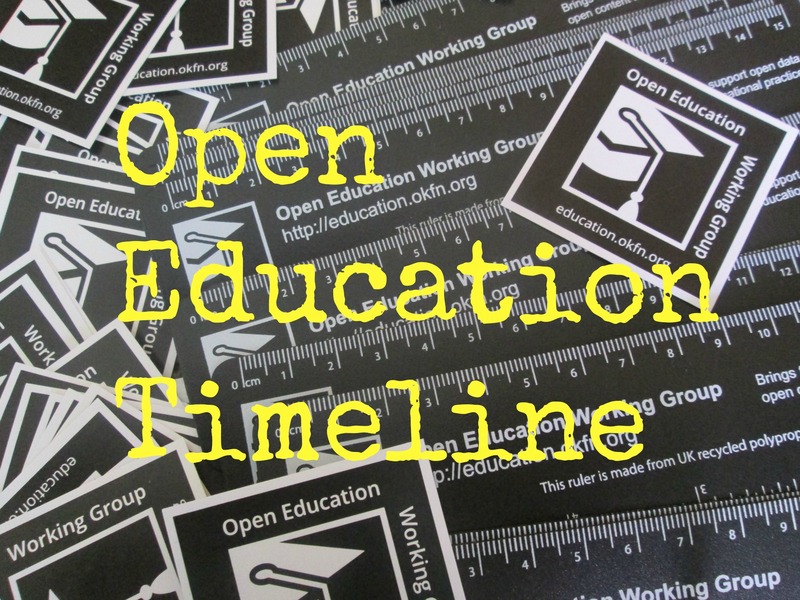 Matteo Uggeri (Fondazione Politecnico di Milano, Digital Learning and Collaboration Area – on Facebook) has written a post for us looking at open education in Italy and focusing on policies in schools. He plans to follow up this post with a later one looking at the situation in Higher Education. 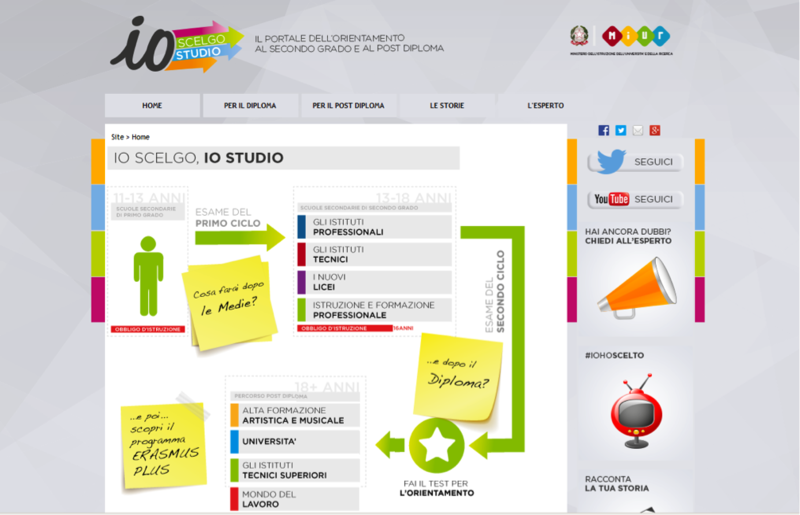 Matteo is a designer specialized in the field of e-collaboration and e-learning. He graduated in multimedia communication design at Politecnico di Milano University, Italy, where he has worked since 1999. Matteo began as webdesigner and then became responsible for EU funded projects and local projects with the Ministry of Education. He is also a teacher in multimedia design and in new technologies in didactics, where he is an expert in web 2.0 tools applications in schools and universities. Mattteo has considerable experience in presentations and speeches and was recently chairman at a presentation session in 2012 at Online Educa on the theme of e-health. He has recently carried a mapping on OERs and MOOCs in Italy. The most relevant project he is now involved with as coordinator and project manager are LeHo, that investigates the applications of innovative technologies in HHE (Home and Hospital Education) and PSO (the Italian Ministry of Education portal for the school in the hospital). 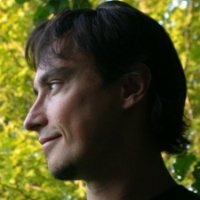 He is also the local project manager of JamToday, another EU funded project focused on the organization of ‘serious game jams’ all around Europe. Alongside his work activities Matteo owns two musical labels where he takes care of graphics and productions, he often works with Italian and foreign musicians and plays experimental music in his spare time. I recently updated previous research conducted by another institution in 2012 in order to check the situation in Italy for school and university in terms of policies and single initiatives. This had to be done quickly (two weeks in June 2013) and with few resources, so my methodology was as follows. Searching the web using search engines or learning networks. Searching the internet led me to a maze of self-styled OER’s and MOOCs. Now in January 2015 I partially updated the whole research for the article you’re now going to read. One of the most general findings was that so far there’s much more for schools especially in terms of policies at a government and regional level than for universities. The reason is probably that in Italy education is, so far and happily, still funded with public budget, especially for schools. We have private schools but most are still public. At the higher education level there are more private universities that are somehow in competition with each others and with public ones. That’s why we’ll find more policies to support open education and more bottom up initiatives in schools. This article will focus more on this aspect, while in a following one we’ll talk about the university level. As said, it seem that there aren’t explicit and precise indications by the Ministry of Education in terms of OER, nor grants about it (and this is the well-known old problem of incentives for teachers who want to integrate the use of technology in teaching, but for now let’s set aside this burning issue), but we can’t say that the government is doing nothing in that sense. I decided to list here the most relevant of them in order to give an overall idea of what happens in our country ‘from above’. Please note than many of them are supported by INDIRE (Istituto Nazionale di Documentazione, Innovazione e Ricerca Educativa, “National Institute for Documentation, Innovation and Educational Research”)). We will find this important Italian institution body often again in the next cases and examples as it’s the one in charge of most of the innovation policies in Italy, including now (2015) the Erasmus+ projects funded by the European Union. 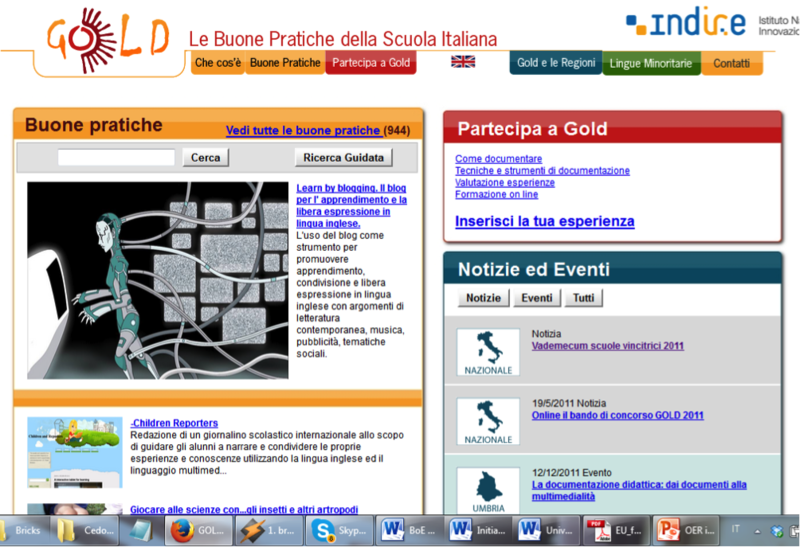 GOLD is indeed supported by INDIRE and is the database of the most innovative teaching practices of Italian schools of every type and level of education and aims at fostering teaching knowledge sharing and school innovation experienced by teachers, particularly those ideas that can travel well from one context to another. The graphics may not be that captivating, but there’s still people using it in spite of the fact that the website was created in 2009 and never technically updated. Puntoedu is the national online environment for teacher training managed by the National Agency for the Development of School Autonomy ANSAS (under INDIRE again). The repository contains more than 3,000 learning objects which have been developed for teachers’ online training by teachers themselves. The main issue in this case is that is not really ‘open’ because only teachers can register and access to the material. That’s why we could say that it’s more an ER than an OER. 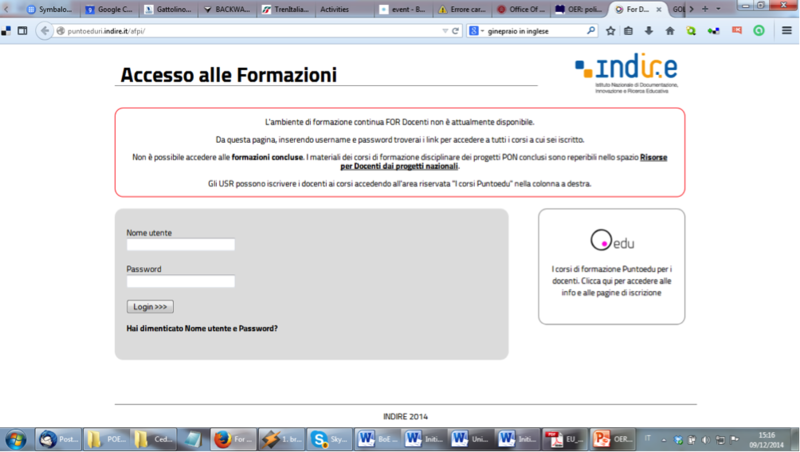 This is the Italian portal to support the transition between different school levels. This National initiative was created to develop a new model of educational guidance that can guarantee support for all the moments of transition and choice of the person, throughout the course of life. 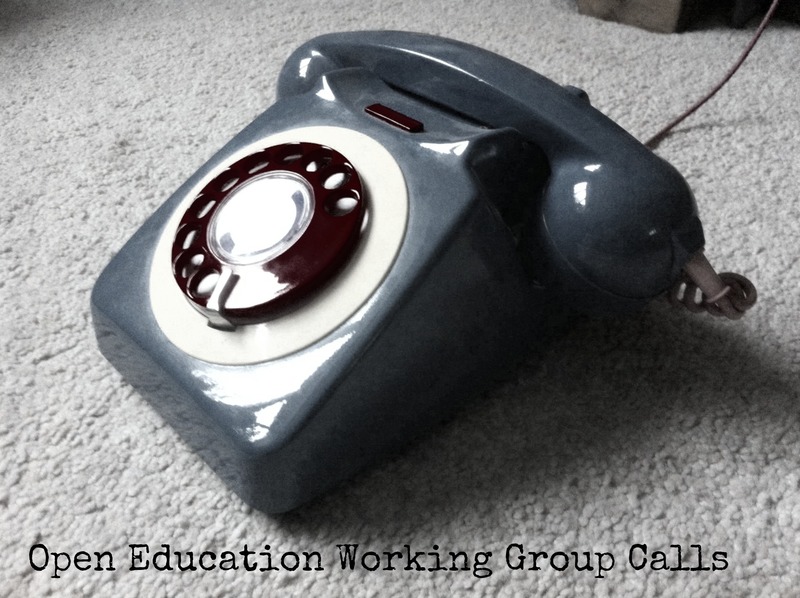 It’s not exactly an OER, but it’s a great tool to support students in orientation. It even provides contact with a person (sort of ‘ask the expert’) at the Ministry level that answers questions from students in order to help them in the labyrinth of choices when they move to higher education. The Voci Vivaci initiative aims to provide an opportunity to teachers, students and other school workers to freely tell their own experiences and the paths taken. Voices and testimonies of the children and the school staff, the initiatives supported and carried out under the two 2007-2013 National Operational Programmes of the education sector (PON). One of the most relevant things is that the project focuses in ‘sharing emotions’, so it has a very ‘light’ and appealing approach for students and teachers that are proactive in didactics. 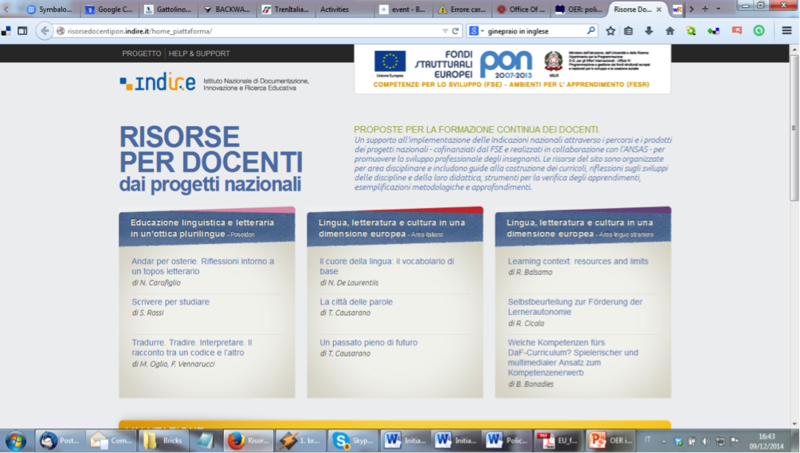 Risorse per docenti dai progetti nazionali is a real OER: it’s a collection of proposals for the lifelong learning and training of teachers. The only problem is that the range of subjects is pretty narrow: languages and literature. It’s a sub-action for the professional development of teachers and promoted by the National Operational Programme 2007/2013, out of the European Social Fund PON-ESF “Competence Development”. It includes activites that may be consulted, experienced and re-used in a wide variety of didactical situation in oder to be re-adapted in a personal way, according to different contexts. This is a regional policy from north of Italy, in Lombardy, one of the most proactive areas in the country. 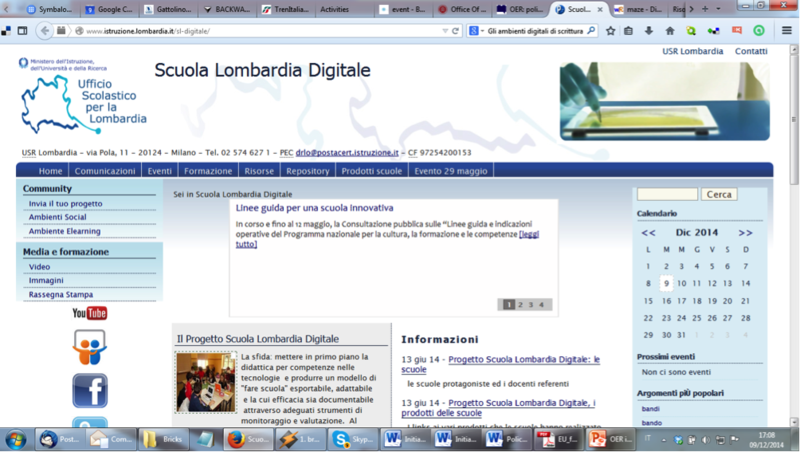 The aim of the Digital School Lombardy initiative is to support the teachers on the ICT teaching skills and then to develop an exportable model of “doing school”, adaptable and whose effectiveness is documented by adequate tools for monitoring and evaluation. It also focuses on the concept of the use of web 2.0 tools in didactics and flipped classroom. These latest examples are on a smaller scale, mostly regional, and may directly bring us to the analysis of bottom-up cases. 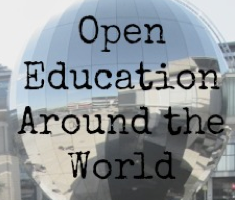 In a follow up article I’ll show some of the most interesting initiatives in schools, companies or other institution all around Italy that may be of interest in the research for open education in Italy. I believe that open education in Italy is growing at a fast pace both from single initiatives from single schools or even teaches, and also from the government side.